During the first thirty-six years of the Broadway Brigade's existence fire fighting in rural areas was still, as it always had been, very much a community effort. The Broadway brigade was typical of the many part-time and volunteer brigades throughout the Country. The standards of these brigades varied widely, some being better equipped than others. The money available to them depended on local interest, and sometimes on the generosity of wealthier members of the community. There was no legislation which compelled any local authority to provide and maintain a fire service. Many parishes, therefore had no service at all. 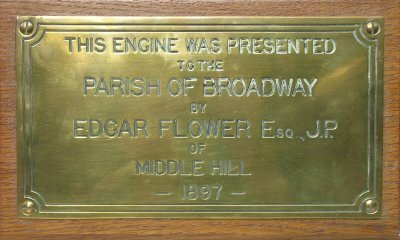 The Broadway brigade was administered from it's formation in 1897 until 1933 by the Lighting and Watching Committee, a sub committee of Broadway Parish Council. All matters relating to the brigade, however trivial, were discussed by them. All expenditure, including repairs, maintenance, and the purchase of new equipment had to be approved by the committee, and the captain of the brigade reported directly to them. When the Broadway Brigade was first formed there was a justifiable pride in the brigade and its equipment. This was, unfortunately, difficult to maintain. Sadly, though almost inevitably, as time passed the equipment became less reliable, and out dated. The infrequency of fire calls (some years there were none at all) naturally led brigade members to lose interest. No retaining fee was paid to firemen so they only received, in the early years at least, payment after attending fires. There was no regular training even though, throughout this period, the absence of drills and practice for the firemen was often raised. For example, in 1919, to encourage the members of the brigade to drill, the committee recommended a payment of 1/6d (7½ pence) per man per hour, and suggested there be three practices a year. The Evesham Journal in its account of a fire at Kilsant House in 1923 reported a prompt turnout by the Broadway brigade. But, on reading the report, a local who had witnessed the incident is said to have commented, "A prompt turnout indeed, two of them, one drunk and the other sober!" Unfortunately it is just this type of incident which is remembered, whilst the effort needed to maintain morale and enthusiasm amongst a part time crew, working with ageing equipment, is forgotten.